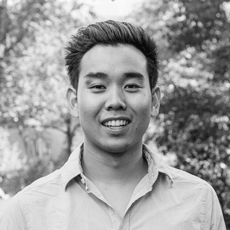 Coming out of school with a marketing degree, I thought I knew what it took to understand who your users are. Create user personas based on demographics, interests (etc. etc. ), run a couple of focus groups, and boom! The personas of Anxious Annie and Fidgety Frank are born. Craft some compelling messages using industry buzz words and watch the sales rush in. Simple right? Boy, was I wrong. Context - This is the "when." In which specific situations are you hiring my product for? User personas do nothing to address when as they focus onwho. Who is ambiguous and leads to assumptions when generalizing user personas, while when specifies concrete situations a potential user (with varying personas) can encounter. Causality - User personas do nothing to uncover the motivations as to why a customer would use or not use your product. Are you more likely to use Bose noise cancelling headphones because you are a 25-55 year old, tech savvy, design-loving businessman or because you need headphones to adequately block noise on frequent flights you take while working? Certainly demographics can correlate with product adoption, but being 30 years old won't cause you to buy the headphones. So how can you apply this to your business today? I'll show you how the Jobs to be Done Framework has made an actionable impact on our marketing and product initiatives. We've recently started to test using Promoted Tweets on Twitter to drive some of our top of the funnel sign-ups. Our first couple of ads performed fairly poorly, with poor cost per sign-up metrics. After talking with one of their ads specialist to get our targeting cleaned up, we felt confident that our ads would start converting better. But they didn't, and we were left scratching our heads wondering why. Take a look at one of our early Promoted Tweets. Our persona we are targeting here is Sales enablement/Product marketing folks who are probably very organized, great communicators, and ruthlessly efficient at prioritizing tasks. 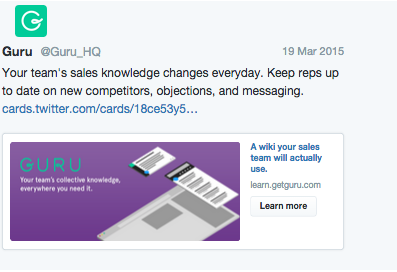 "Keeping sales reps up to date with the latest content" - sounds like a job though right? It is, but the problem is that we are starting with too many assumptions first with our user persona. At every company, sales enablement and product marketing people will have differing responsibilities. The very fact that we were targeting 2 different roles speaks to the problem our user persona defined story illustrates. Who we were really targeting is whoever in the company has the job of updating their sales team with the latest content. The specific role, personality type, or demographics didn't matter, just the situations they encountered. Now, take a look at our best performing Promoted tweet. By starting with the job of "keeping sales team up to date with the latest content" in mind we were able to identify the problem our product is uniquely positioned to solve with our job story: "When experts on your team keep reps up to date on content, they want to do so in one place that is noise-free (ie- not email or chat), so that they can reduce shoulder taps and one-off messages from sales reps that distract them from their job." 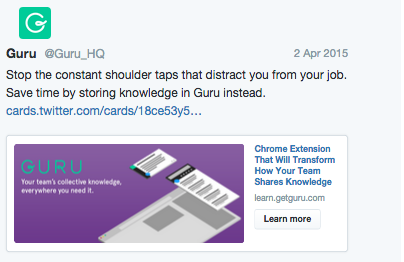 The main benefit to the sales enablement/product marketing persona is not keeping the reps up to date with the latest content, but the shoulder taps that are eliminated from storing knowledge in Guru. In addition, our potential user could be 25 or 52 and organized or messy and it doesn't change how we frame the message to them. We couldn't convey every component of our job story in a single tweet, but even still this job-focused promoted tweet had a sign-up conversion rate that was four times better than any of our previous attempts. By simply adapting the messaging to focus on jobs-to-be done, we were also able to cut the cost per sign-up in half. The result of using the jobs-to-be-done framework is that your product won't be defined by a product category. Categories make sense when they reflect the way people work today. But thats the thing, the way people work today is quickly evolving, which renders many categories obsolete. In fact, one of the outcomes of focusing on this new model of product design is that the breakout companies that do it end up creating the next set of categories for a new industry. For instance, Intercom, a vocal proponent of jobs-to-be-done, messages its product as "the one place for your entire business to see and talk to customers." That means its product has elements of live chat, analytics, CRM, helpdesk, and email solutions. They haven't boxed themselves in within a specific product category. Instead they focus on one broad job (how to see and talk to customers) that can be broken down into smaller and smaller jobs, which correspond to specific features in their product. For us, our central job to solve for is how teams capture and share knowledge. That's why our product now has aspects/features traditionally found in products in the Q&A, messaging, enterprise search, internal wikis, and document storage product categories. The key benefit of this is simple: Freedom. No longer do you have to think about copying a feature of a competitor or deprioritizing a potential value adding feature in order to "keep up" with product standards across your industry. More importantly, you become much harder to imitate by your competitors and depending on the problem, are able to easily cross into new product categories and industries. So what are you waiting for? Try it out and let us know how it's delivering results for your business!